Where the river Fen leaves the mountains and winds its way through the grasslands of Shanxi, the provincial capital of Taiyuan, aptly named “The Great Plains”, rests on the riverbanks. Just over 4 million people call this city home but, in a place as expansive as this, there’s definitely room to spare! At first glance, this coal-mining city may appear industrial and modern, but its historical pedigree stretches back over 2,000 years. Evidence suggests that the area was settled as early as 859 BC by the Rong people, who were driven out of the region by the Beidi people in 662 BC. During the late Han Dynasty (206 BC–220 AD), Taiyuan was established as the capital of the ancient province of Bing. When the Eastern Wei (534-550) and the Northern Qi (550-577) dynasties ruled over northern China respectively, they nominated the city as their secondary capital and under their reign it grew into a large and prosperous city. In fact, in its history Taiyuan would receive nearly as many promotions as the Emperor had concubines! Li Yuan, the founder of the Tang Dynasty (618-907), was from Taiyuan and began his conquest of China with the city as his base. The support he received from the local aristocracy was integral to his success because actions may speak louder than words, but money talks the loudest of them all! Not long after the Tang Dynasty was established, the cave temples at Mount Tianlong were constructed just southwest of the city. Eventually Taiyuan was designated as the Tang’s northern capital and was developed into a heavily fortified military base. When the Song Dynasty (960-1279) reunified China in 960, Taiyuan continued to resist and was eventually destroyed during warfare in 979. In 982 a new city was established on the banks of the Fen River, just a short distance from the ruined old city. Throughout the Song and Yuan (1271-1368) dynasties, it enjoyed a higher status as a prefecture-level city and received a further upgrade during the Ming (1368-1644) and Qing (1644-1912) dynasties when it became the capital of Shanxi province. From the Xinhai Revolution in 1911 to the end of the Chinese Civil War in 1949, Shanxi was under the control of a warlord named Yan Xishan. Under his guidance, the province flourished and expanded industrially by consistently avoiding conflict during the major battles throughout the 1910s and 1920s. With that in mind, the title of warlord hardly seems befitting! In 1937, the Japanese army occupied Taiyuan but worked with Yan to help advance the city’s industries further. When the Japanese finally surrendered in 1945, the troops that were stationed in the city decided to fight for Yan rather than return to Japan. However in 1949, after a bloody and destructive battle, the Communists took control of the city and it has remained largely unchanged to this day. 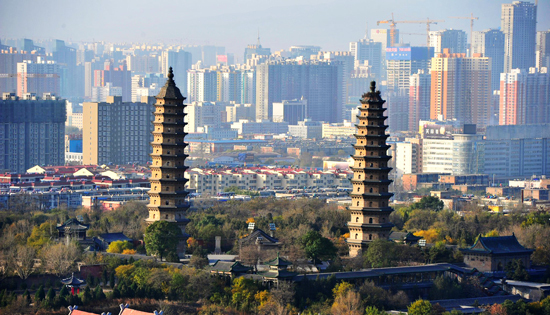 Nowadays the city’s symbol is that of two pagodas and is based upon the local Yongzuo Temple, which contains the tallest pair of twin pagodas in China. They were both built during the Ming Dynasty but, while the West Pagoda is 55 metres tall, the East Pagoda is only 53 metres in height. So not exactly identical twins! Another ancient staple of the city is Chongshan Temple, which was originally built during the Tang Dynasty. Sadly, during the 19th century, much of the temple was destroyed but several of the halls still remain intact. The main hall is renowned for its magnificent statue of the goddess Guanyin, who is depicted with a thousand hands and a thousand eyes. Bear in mind, the statue does not literally have a thousand of each, as that would be far too creepy! Just 25 kilometres (16 mi) southwest of the city, at the foot of Mount Xuanweng, lies the glorious Jinci Temple. It was founded nearly 1,400 years ago and was subsequently expanded during each dynasty, meaning it contains over 100 sculptures, buildings, and other architectural pieces that reflect the styles of several different eras. The Hall of the Holy Mother, which was constructed in 1032, is the oldest surviving building in Taiyuan Prefecture and has vivid carvings of wooden dragons winding their way up its eight pillars. Venture out a little further, about 40 kilometres (25 mi) southwest of the city proper, and you’ll find the Tianlong Mountain Grottoes. This series of 25 manmade caves carved into the mountainside contain some spectacular Buddhist statues and decorations. At the grand old age of 1,500 years, caves number 2 and 3 are the oldest and are currently enjoying a long and much deserved retirement!